So there I was, riding my moped through the Vietnamese countryside, watching women in conical hats work the patties as we cruised towards the beautiful white sands of the coast. Okay, no worries, you don’t have to hate me. The real story is that I was perusing the Sunday paper and stumbled upon a curious recipe for a sandwich I’d never heard of. Take one bite of this Banh Mi sandwich and you’ll be transported to another world. Banh Mi sandwiches are a staple in Vietnam and it isn’t hard to see why. I like to call it “adventure in a bun.” But don’t get scared. Just stay with me. The ingredients are all familiar, just a novel combination. I may have lost some of you already but if you can get past this part I know you’re through to the end. Here are the three ingredients you’ll be adding to your collection. You’ll find them all on the top shelf of the Asian/International section for your grocery store. Even Wal-mart has them, so no excuses. Sriracha sauce (the one with the rooster), sweet red chili sauce (the key ingredient in my opinion), and seasoned rice vinegar (expendable– substitute another vinegar and we can still be friends). Baguettes are very important. Try to find one with a hard outer shell and a soft inside. Think French bakery and you’ll be fine. Vinegar is a great low-cal way to knock up the flavor of any dish. In this sandwich, we’re making a quick pickle for the cucumbers and carrots. Equal parts of sugar and vinegar plus a dash of salt. Dissolve and add veggies. Let them marinate for an hour or so. I like to use a rotisserie chicken because of the flavor and ease. I serve the bread with the mayo and chicken on top. Then I’ll let my guests add their own sauce, veggies, and herbs. Start piling on the toppings: pickled cucumber and carrots, cilantro and mint (please, I beg you, don’t skip the mint! ), lettuce, sweet chili sauce and sriracha for the kick. Don’t be bashful. Sweet chili sauce packs a serious flavor punch, so load up! Now the Sriracha… you can be much more conservative with that one. Don’t say I didn’t warn you. It has the ability to blow your socks off. Oh… yeah…. bite marks on your computer screen are NOT my fault. Make sure you let me know if you try the real thing, especially if you test any new variations. Do ahead: Combine vinegar, sugar and salt until dissolved. Add to cucumber and carrots. Set aside. To make the sandwich, spread both sides of the baguette with mayonnaise. Arrange chicken over the bottom halves. Add lettuce, herbs, and cucumber-carrot mixture. Add top halves and serve with lots of napkins. Do ahead: Combine vinegar, sugar and salt until dissolved. Add to cucumber and carrots. Set aside. To make the sandwich, spread both sides of the baguette with mayonnaise. Arrange chicken over the bottom halves. Add lettuce, herbs, and cucumber-carrot mixture. Drizzle with the sauces. Add top halves and serve with lots of napkins. Serves 4. Seriously Jealous!!! This looks so good. I’ll be trying it. Yum, Sarah! With grocery store rotisserie chicken, this sounds easy and who doesn’t need a new spin on sandwich-making? Once again I am amazed at what you come up with, Sarah – and you crack me up! I LOVE pickled cucumbers, my plant can’t keep up with me this summer – I will definitely be trying this! ok, wait a minute. I just noticed – that is Aunt Joan’s house! Why, I want to know, was I not invited to this feast. We are in a fight right now. It’s not what it looks like… ok, maybe it is… but either way, you’ll have to take it up with Joan. I was just following orders! Yummy! Thanks for the recipe I’m going to try it soon! I love these sandwiches! MaN, I love a good sandwich, and this looks like a good sandwich, and not too hard. Where is this deli located? The sandwich looks delish!!! Yum! I love pickled anything. I will definitely have to try this out. As someone who came to love the banh mi in slightly sketchy chinatown sandwich shops, it’s really interesting to me to see someone just sort of give one a shot. The sandwiches are delightful, and one in particular (http://bit.ly/ptkqd2) is by far the greatest sandwich I’ve ever eaten. As someone who is so fond of them, I find myself on the defensive a bit when someone tries one. I desperately want them to love the sandwich as I have loved them, and I perpetually fear someone biting in and thinking “That’s it?” So I’m glad to see a post where the sandwiches are enjoyed. And what’s more, someone who enjoyed them when the meat is more-or-less plain. In the dozen or so Vietnamese sandwich shops I’ve tried, all have their own spin on a fish sauce/garlic/honey/pepper marinade. Even independent of the rest of the sandwich, the meat is often savory perfection. Combined with a crunchy baguette and some crispy veggies, the whole thing is transcendent. If you’re in a major city, you owe it to yourself to track down a real one. Although chicken, fish and veggie banh mis are all really good, a pork banh mi is the undisputed champ. Nice post, and again, glad to see you enjoyed the sandwich. I saw recipes for the pork version but was a bit intimidated. I’m glad to hear how good they are. I’ll have to try it next time! Thanks for the comment and let me know of any restaurants you love for the real deal. 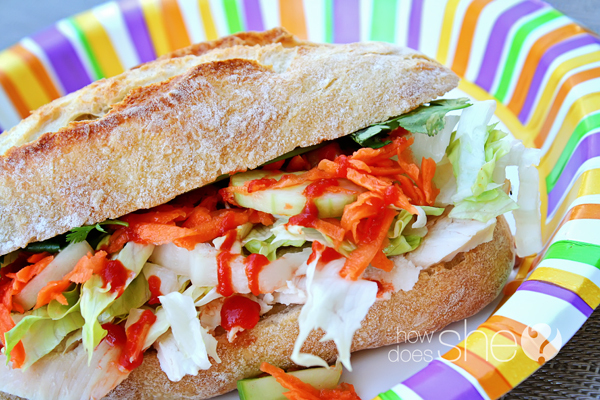 I love these Bahn Mi sandwiches and felt honored to have the photographs taken in my kitchen. Good job Sarah. Good post as usual and awesome sandwiches! They really are delicious and so easy to make. Really? Mayo? Vietnamese use Mayo? I’ll give it a try, minus the mayo. Yuck! Sarah, I made these last night and they were awesome! I love how you used rotisserie chicken–it makes it so much easier. Also got some mint from my neighbor’s garden and I agree…it shouldn’t be skipped! Thanks again for a fun, different recipe.